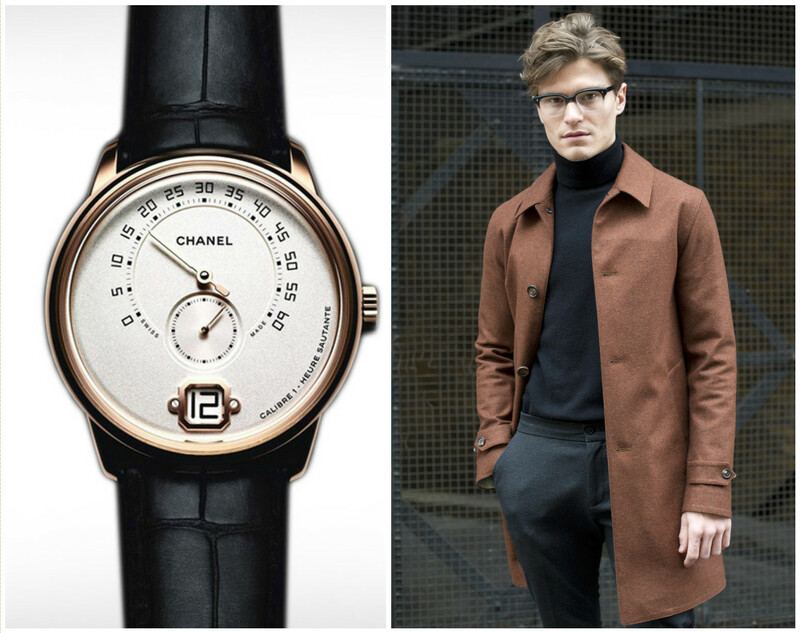 The Basel Lookbook, in which our friend and fashion advisor Ceri David casts an eye over the best releases of Baselworld and suggests what might look nice to wear with them. If you’d like sass with that, you’ll be most pleased. 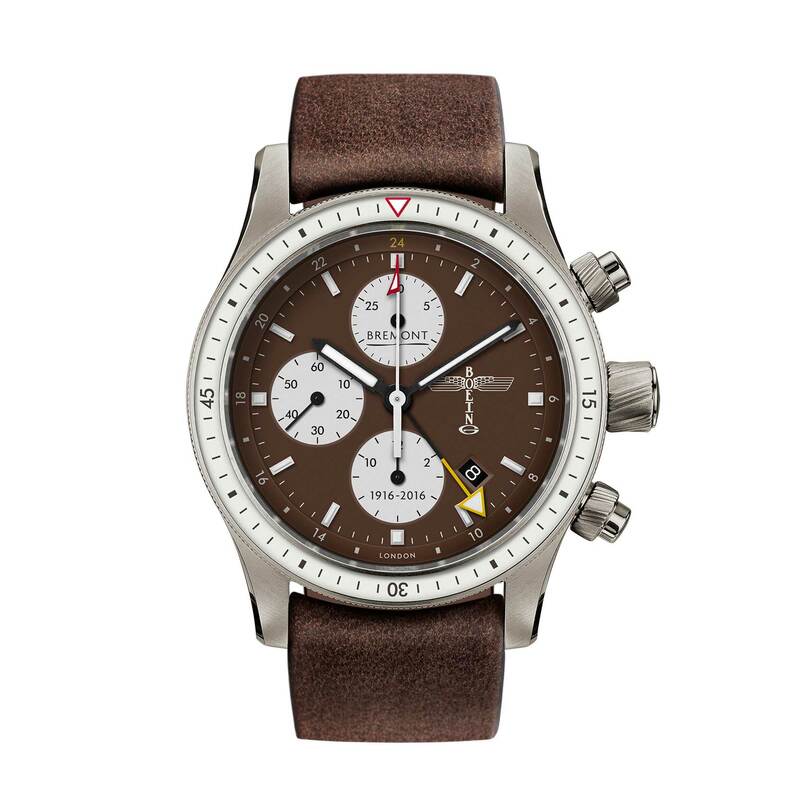 The limited edition Bremont Boeing 100. 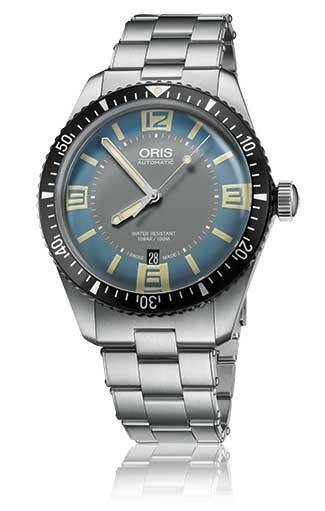 The retro-tastic Oris Divers Sixty Five in Deauville blue, on a steel bracelet. 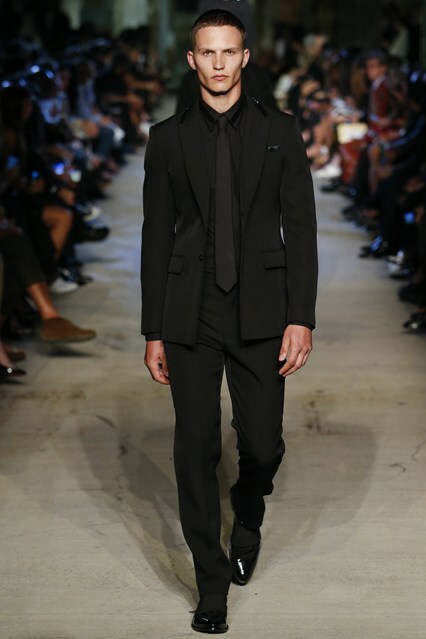 If you don’t yet have a double-breasted suit in your closet, what are you waiting for? 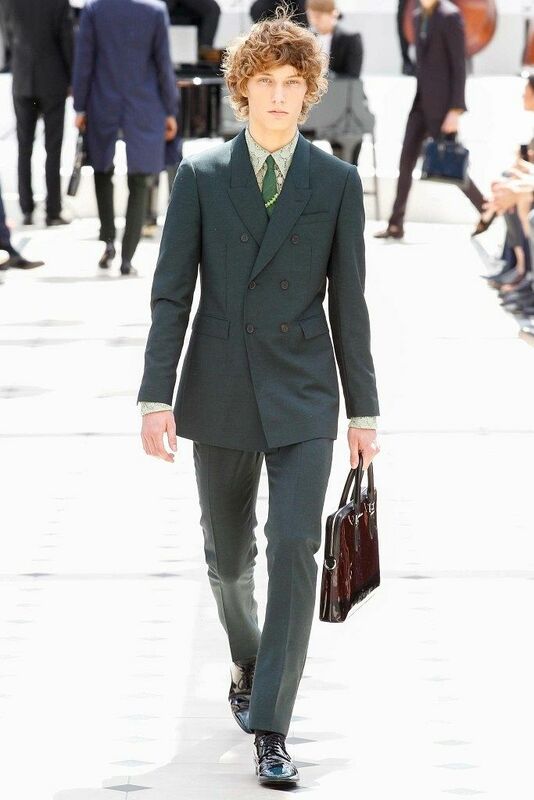 Granted, we all grew up associating the style with chaps of a more elderly, portly stature, but this hip young thang on the Burberry runway proves you don’t need to be anywhere near gout territory to rock it well. 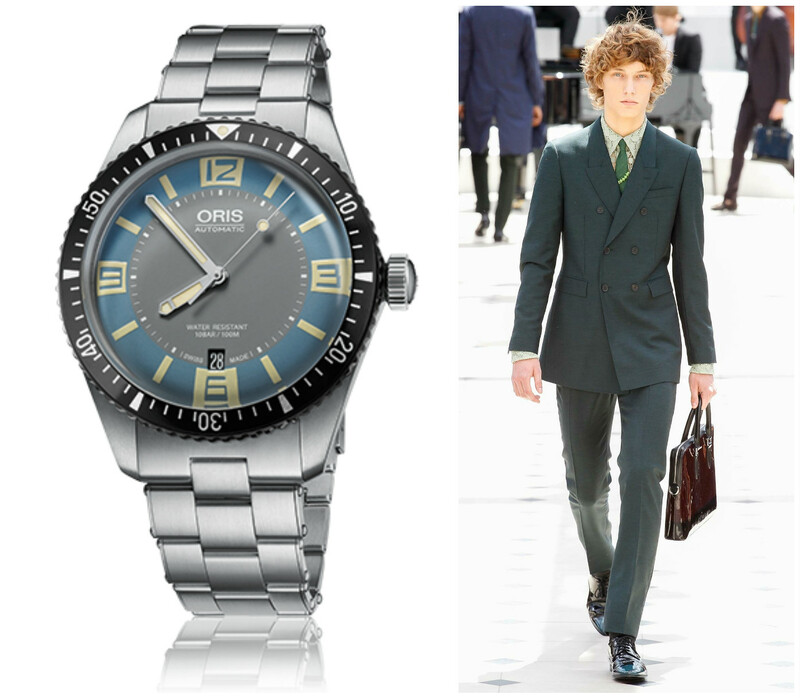 Putting it with this Oris also gives you a chance to have a go at mixing your blues and greens, from cerulean and azure to emerald and olive. Yes – even with red hair. 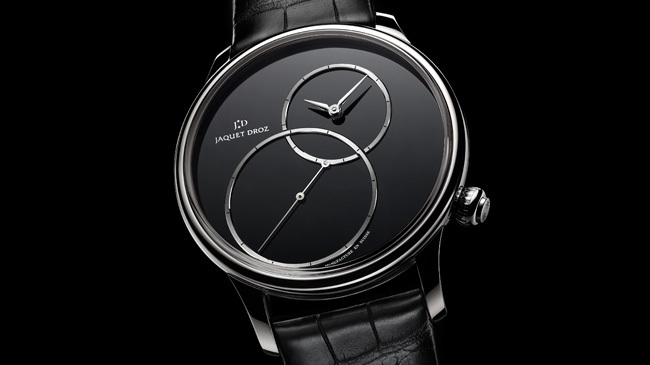 Jaquet Droz Grande Seconde Off-Centred Onyx. 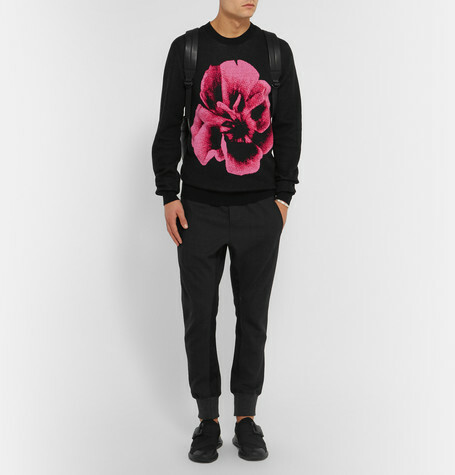 Florals are big for gents this year, but unless you’re happy looking like a set of unruly herbaceous borders, keep it contained. 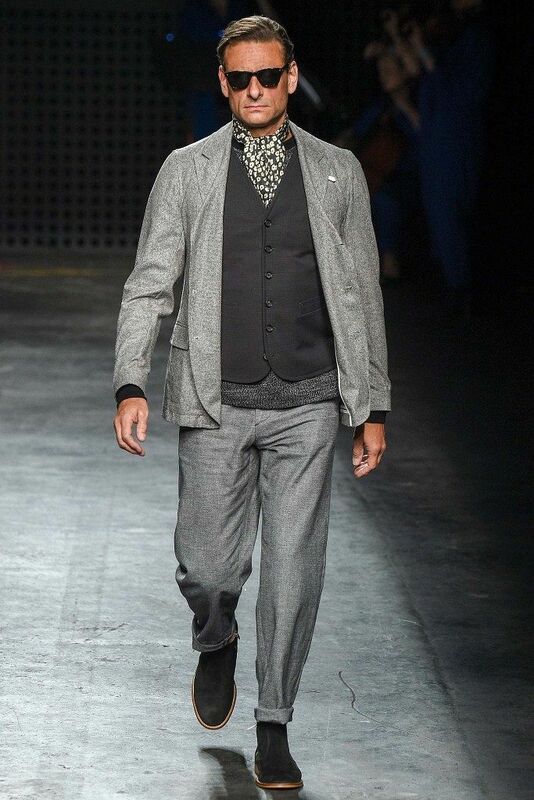 Don’t, for example, go for a full floral three-piece suit, unless you’re feeling very brave. 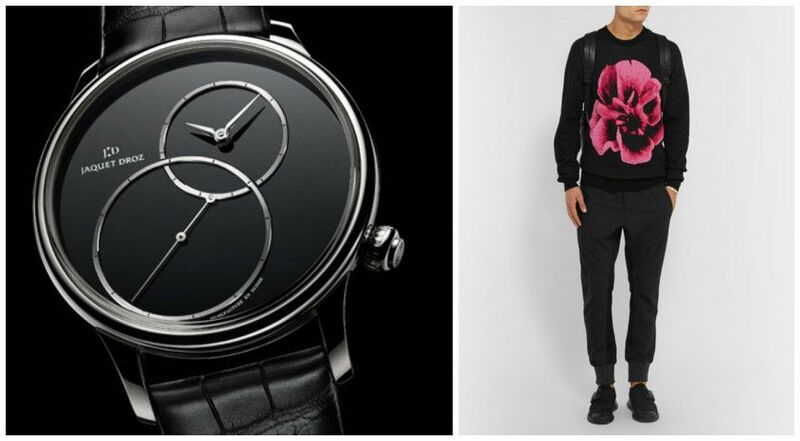 A jumper such as this beauty by McQ keeps the trend at street level, as does teaming it with a fairly minimal watch, like this one. 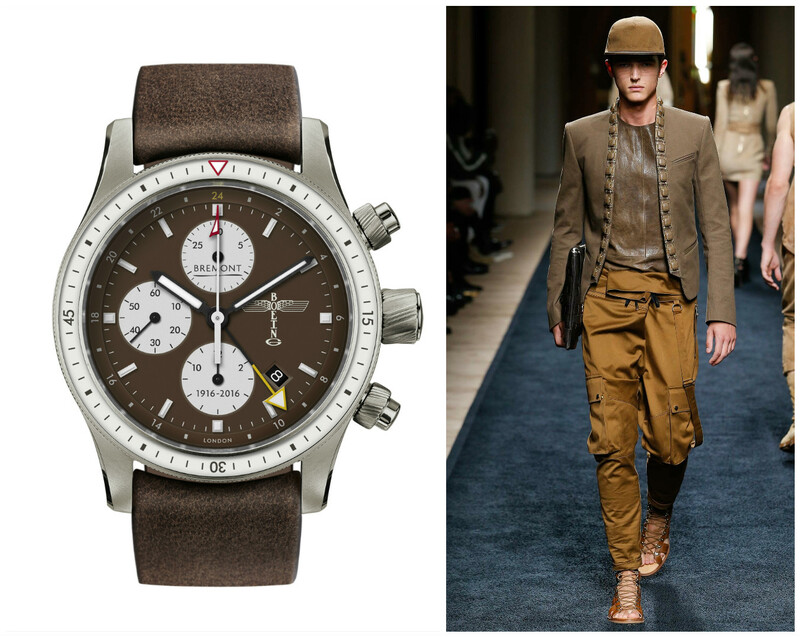 When it comes to military styling, resistance is futile against a trend that reinvents itself with such cunning each and every season that there is literally no way to stop it infiltrating your wardrobe. 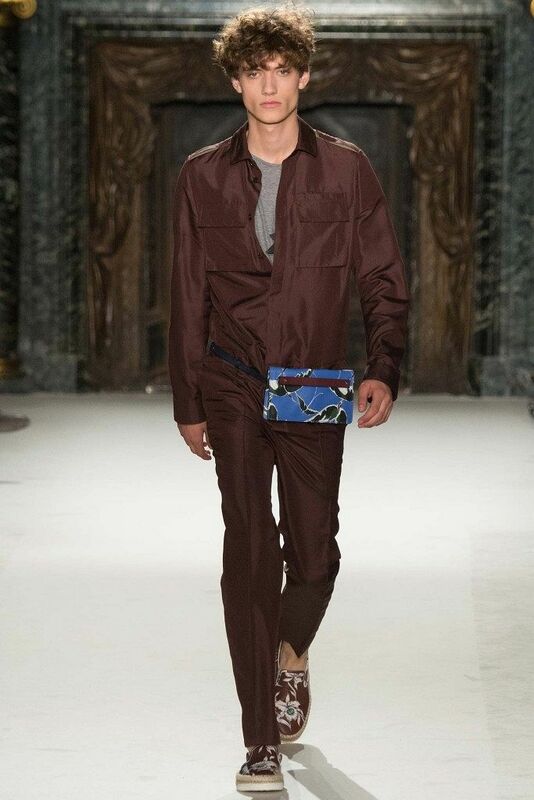 Just as we’re learning to live with an onslaught of epaulettes and shiny buttons, bam, we get walloped with a blanket of desert camouflage from the opposite direction. We surrender! Happily, this is a more subtle take on things, by AMI. 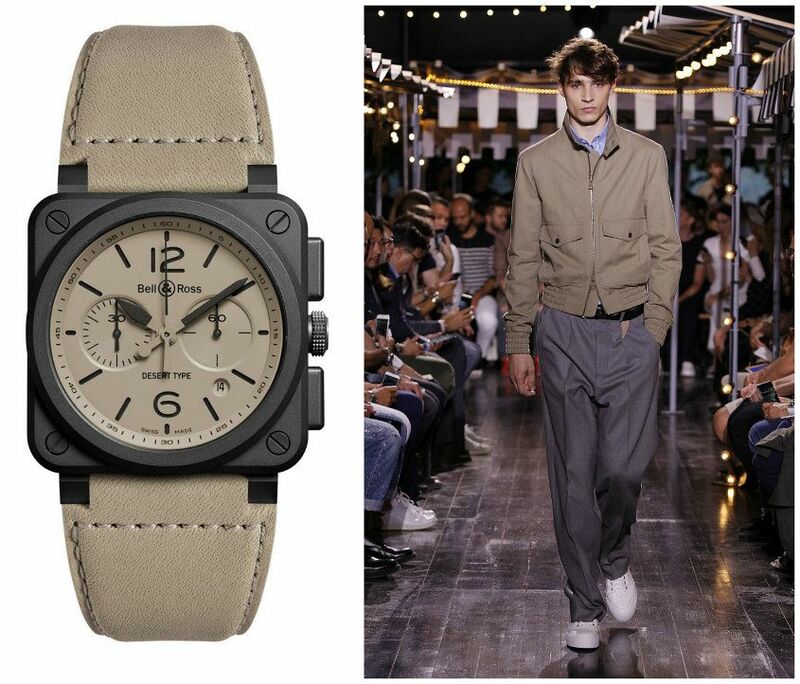 We’re calling it ‘Off-duty 1950s Bombardier’, and it’s a perfect match for the Bell & Ross. 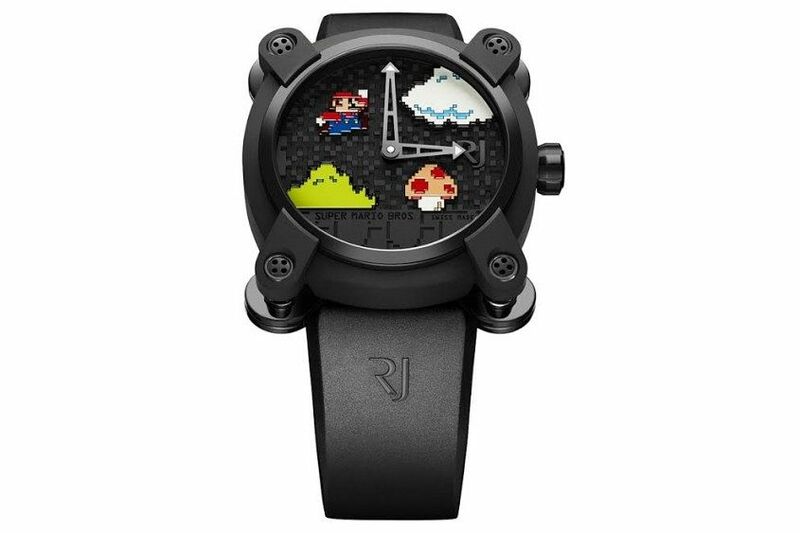 The Romain Jerome Super Mario Bros. watch. Clearly it will come as a disappointment that we’re not suggesting dungarees and a ginormously luxuriant moustache here, but someone has to be the voice of reason, and it’s not you lot with your cupboard full of Mario and Luigi merch. 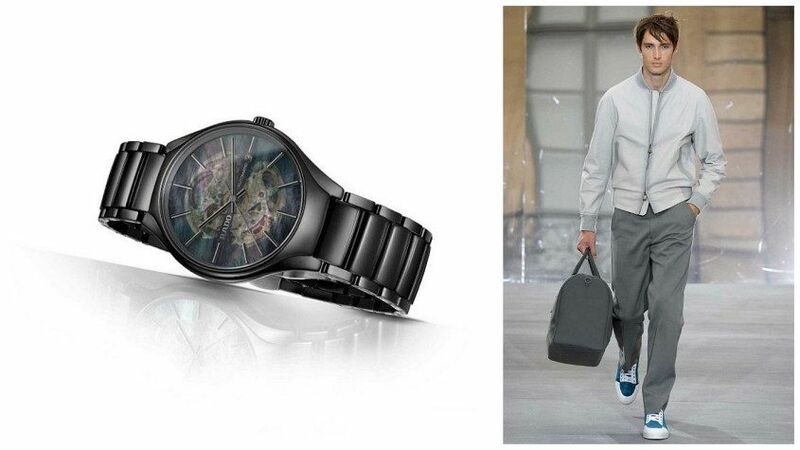 But seriously, your best bet with a watch that’s big on personality is to pare back the rest of your look. This Jac+Jack ensemble is exactly what we mean, the cropped pants adding a touch of intrigue while stopping well short of making you look like you’re en route to Comic-Con. 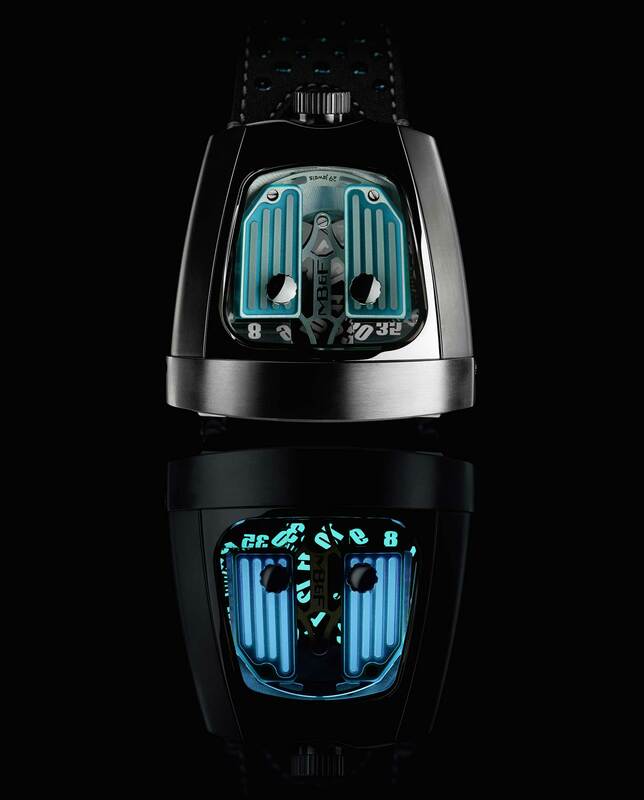 It’s the MB&F HMX Black Badger edition. 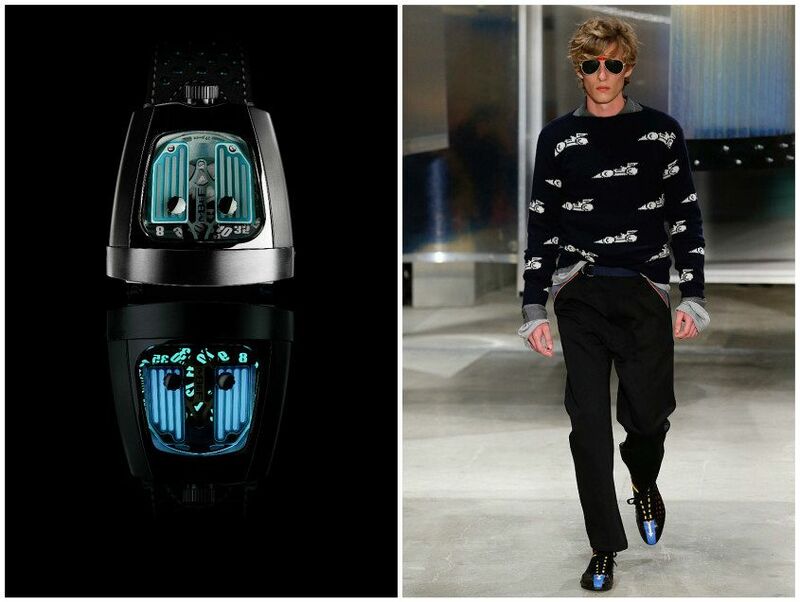 The top view is during daylight; the bottom is after dark, when the watch’s photoluminescent composite does its thing. 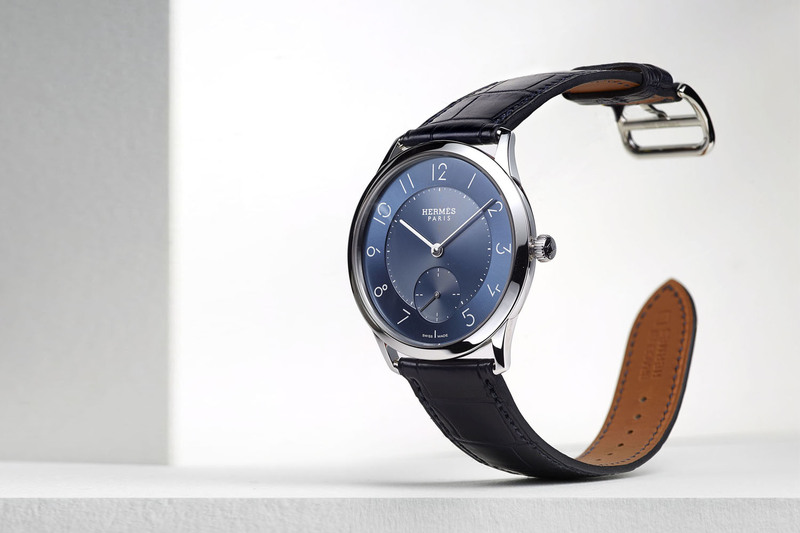 If you’re going to pony up for this watch, seriously, you’re not someone who wants style advice from us – and fair enough. But in for a penny… Despite a persuasive campaign from certain members of Team T+T to pair this with the entire glo-tastic wardrobe from Tron Legacy, we’ve decided to ignore the obvious and to run instead with the automotive theme of the HBX. 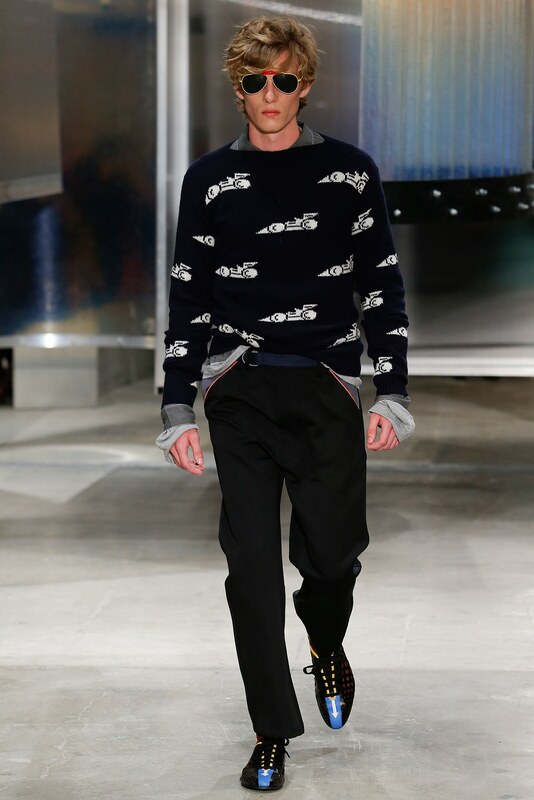 Hence, this masterpiece from Prada’s SS16 runway in Milan. 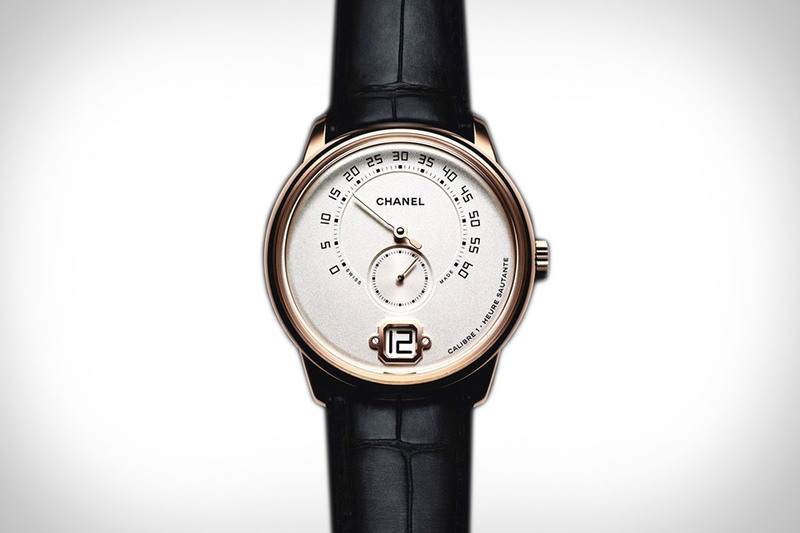 It’s the Chanel Monsieur – the French fashion house’s first watch specifically designed for men. 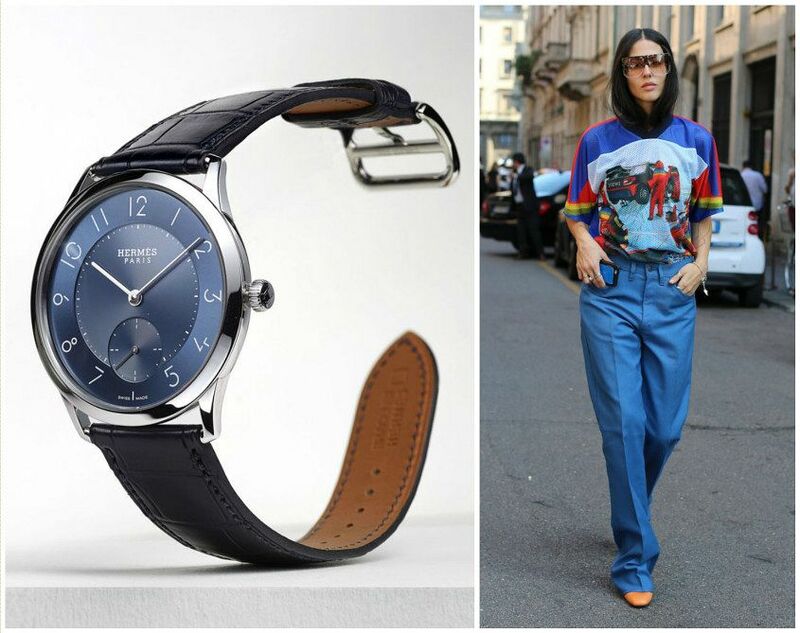 A mix of the classical and the quirky, this works brilliantly alongside the turtleneck revival – and be-fore you start scoffing, let us remind you that this is a wardrobe staple which can lend itself to a surprising variety of looks. Granted, it’s hard to go past ’90s era Lionel Richie (“You are my destiny, You are my one and only…”), but our choice right now is luxe-beatnik-professor, as seen here on the chilly streets of London town. 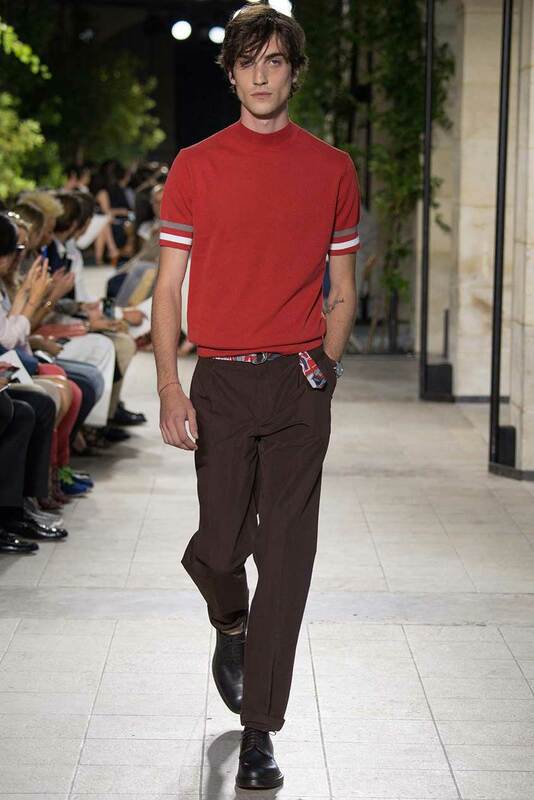 Hermés continues to kick it out of the park with this collection, and we especially love its versatility on the unisex front. Introducing a beautiful dress watch into a street look like this is a sneaky way to make it that little bit more grown-up without crossing the line into dressing like you belong in the retirement village down the road. It’s a whole new level of reverse-subversive. Or something. 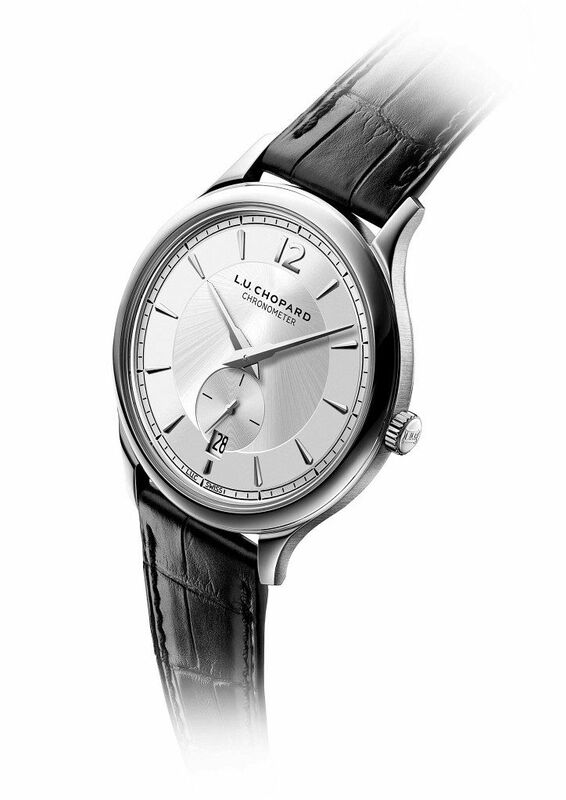 The limited edition Chopard L.U.C XPS 1860 in steel. 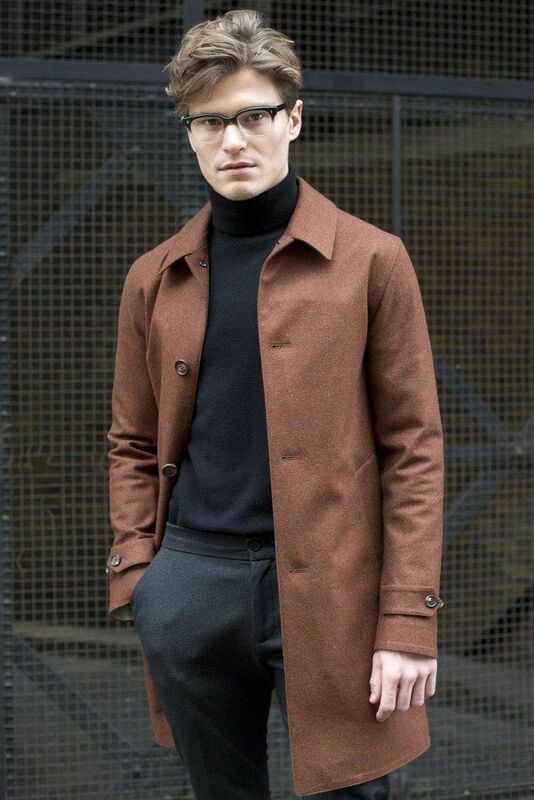 It’s well worth learning how to blend smart with casual, because the result is an exponentially stronger look than either of those as standalone options. And even if it takes you a whole Saturday afternoon of trial and error in front of the mirror, once you’ve found the balance, you’re set. 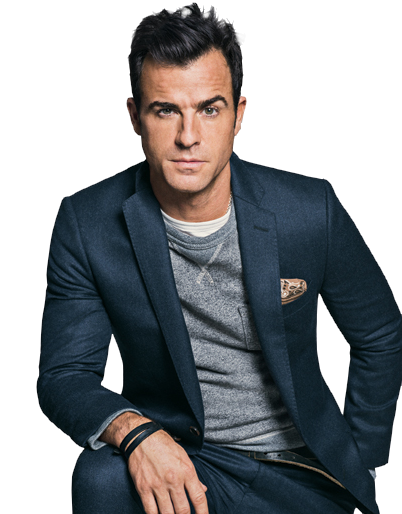 Start by choosing a slim fitting suit and trying different fine-gauge layers beneath – or just copy Justin Theroux, in petrol-blue tailoring over a grey marle sweatshirt, dandied up with a pocket square. (It works for Jennifer Aniston, should further incentive be required.) 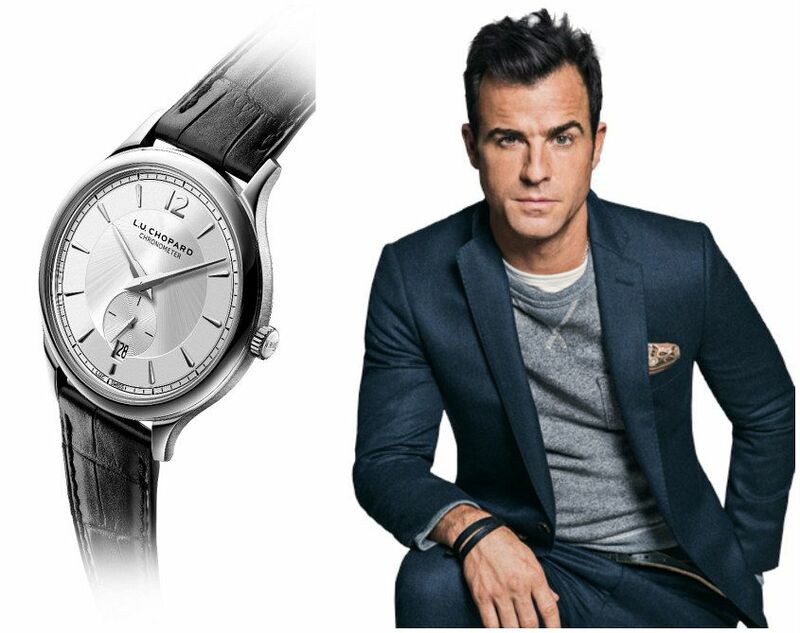 For the finishing touch, add an elegant dress watch. Obviously. 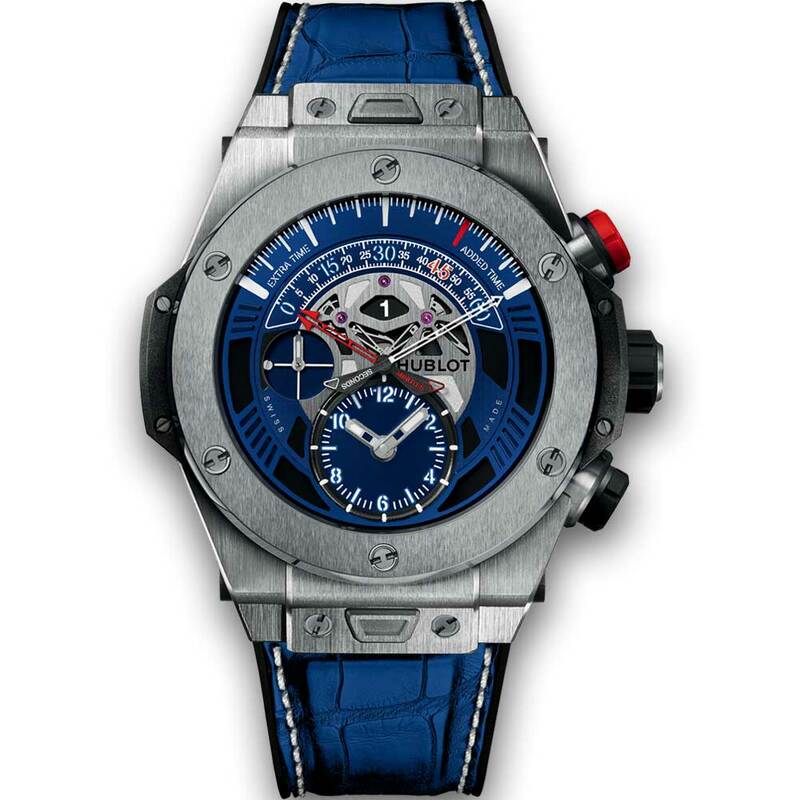 Hublot’s Big Bang Unico Chrono Bi-Retrograde UEFA EURO 2016. No red cards here. Wait – don’t go! Don’t quit your browser and unsubscribe from all further T+T correspondence! Hear us out. First up, we get it: not all of you are in the market for a couture jumpsuit. But don’t shoot the messenger. 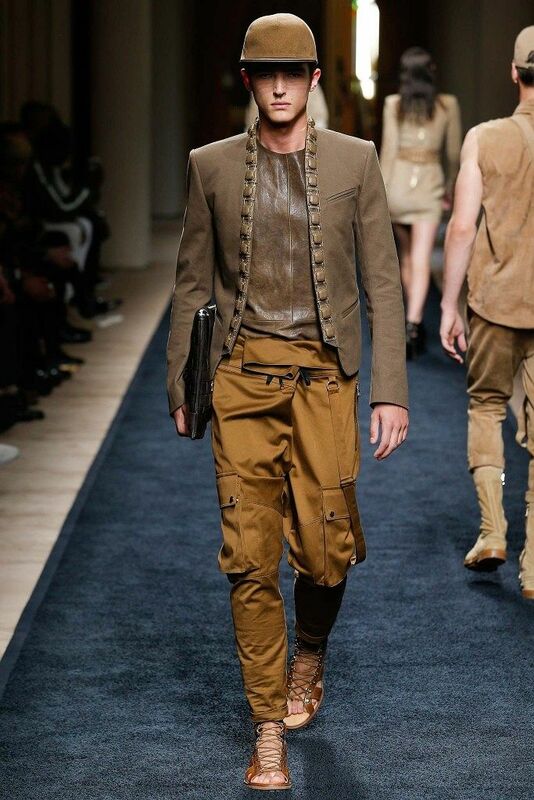 Consider this a public service announcement to make you aware that overalls have been popping up all over the menswear runways, from Kenzo to Fendi to Alexander Wang. 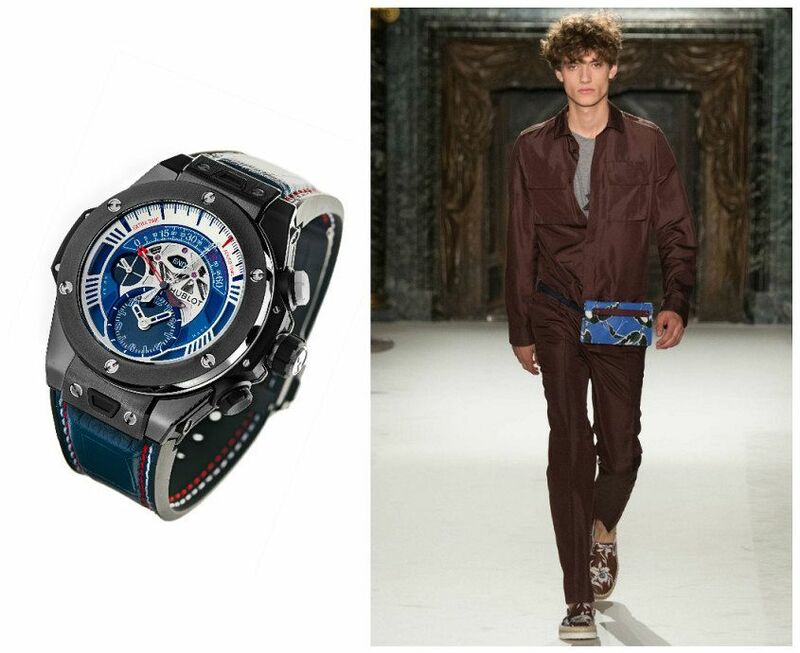 FYI this set is Valentino – and if you were at all tempted to try it, we say do it with a Big Bang on your arm. A ballsy stance, for sure. Your call. The mighty Seiko Prospex Marinemaster GPS Solar Dual-Time. 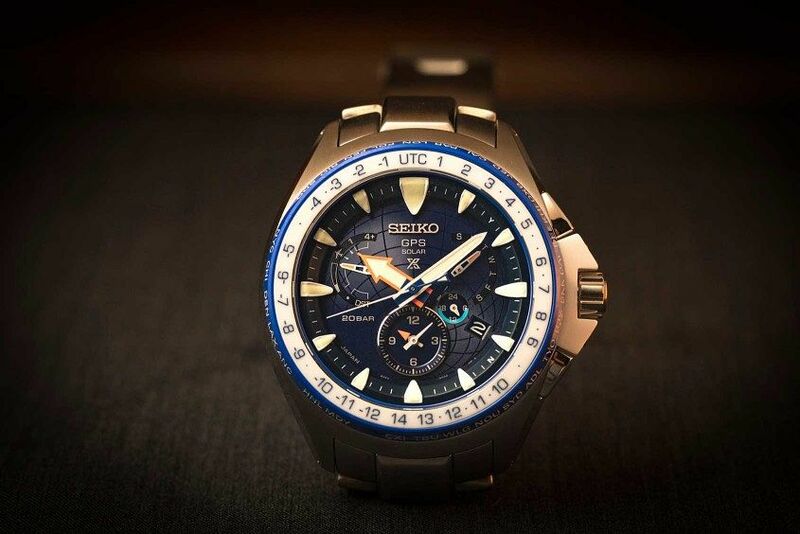 Designed to stand up to the harsh conditions of the open sea, this watch could have been paired with almost anything from the apparel section at Anaconda – but don’t be put off if you’re not that salty a dog. 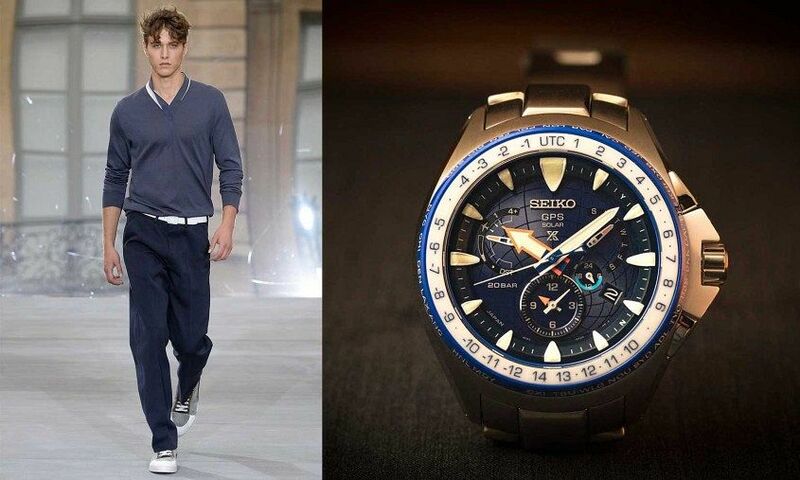 Just pop on an ‘Ocean Swell’ soundtrack, climb into this palette of stormy blues from Berluti and make yourself a jug of sea breeze. 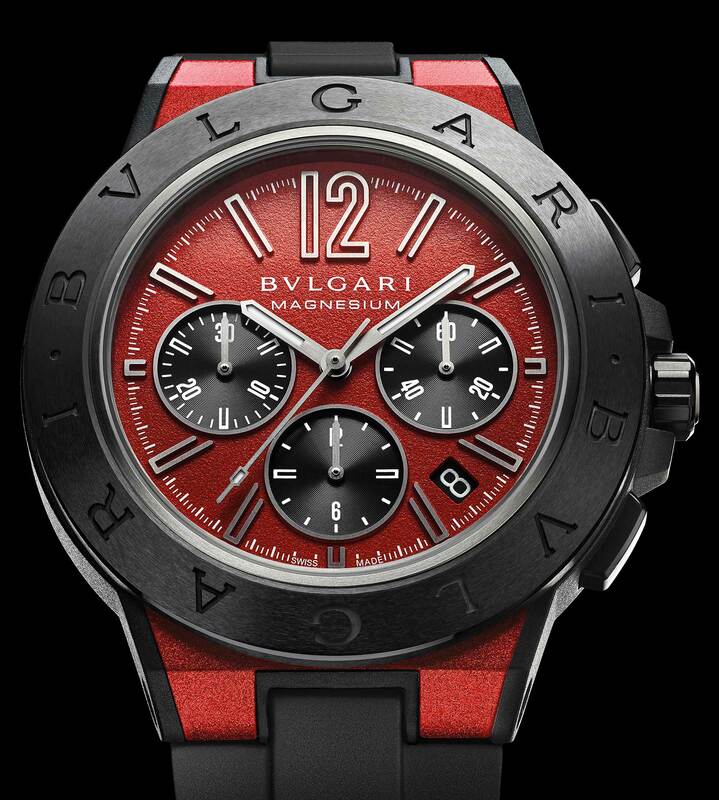 This red rocket is the Bulgari Magnesium Diagono Chronograph. Chances are, if you choose a red watch, you’re a fan of the colour and everything it stands for: danger, passion, fire engines, birdseye chillis. As with the rest of that list, red should be treated with respect, handled carefully and under no circumstances overused. Disregard that warning and you’re likely to end up burnt, exhausted and as well dressed as the red Wiggle. 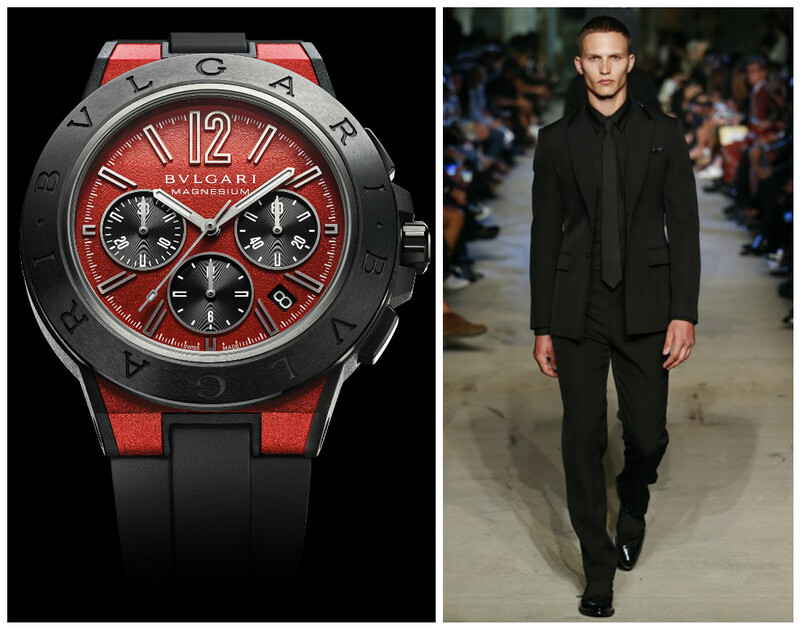 But a tiny splash of red at the wrist, peeping out from beneath head-to-toe black Givenchy? Now that’s hot. Image via Tom Craig, matchesfashion.com. 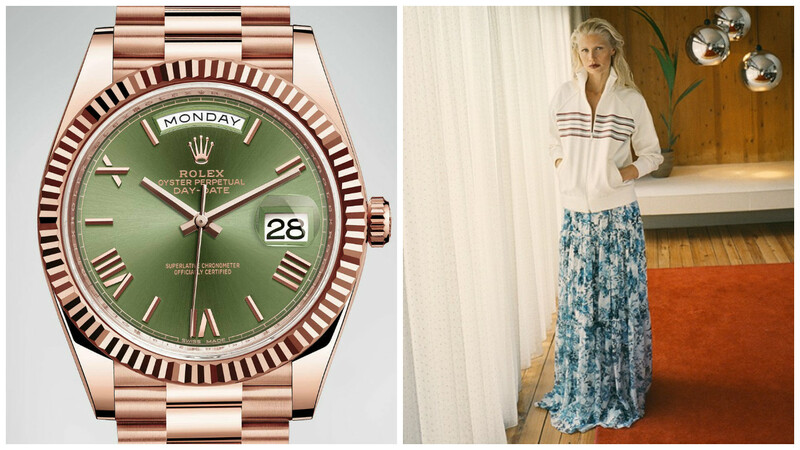 The tabloids may have had their knickers in a twist over gender fluidity this past year, but it’s old news in the watch world – and this Rolex is a faultless example of that unisex appeal. 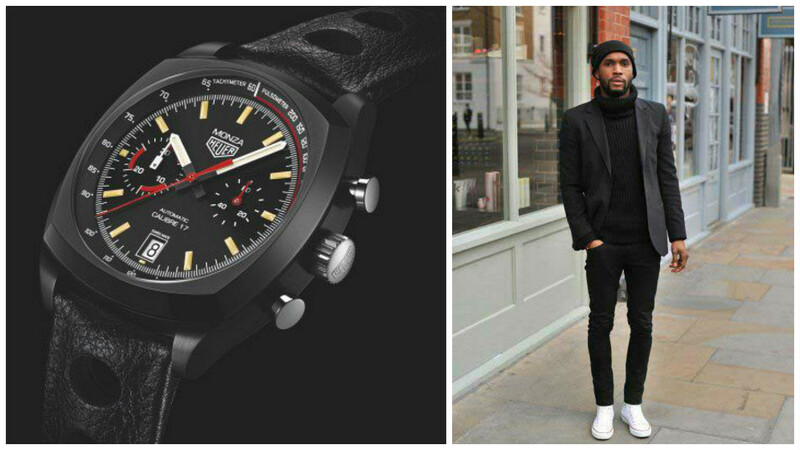 Likewise, sports-luxe – the trend we’re teaming it with – works for both men and women. Worn top-to-toe, you can end up looking like one of Run DMC, so for best results apply sparingly, as per this Hiller Bartley jacket that’s been softened up with an Erdem skirt, both from MatchesFashion. Chaps – feel free to swap the floral skirt for a nice chino. Or not. No judgery here. 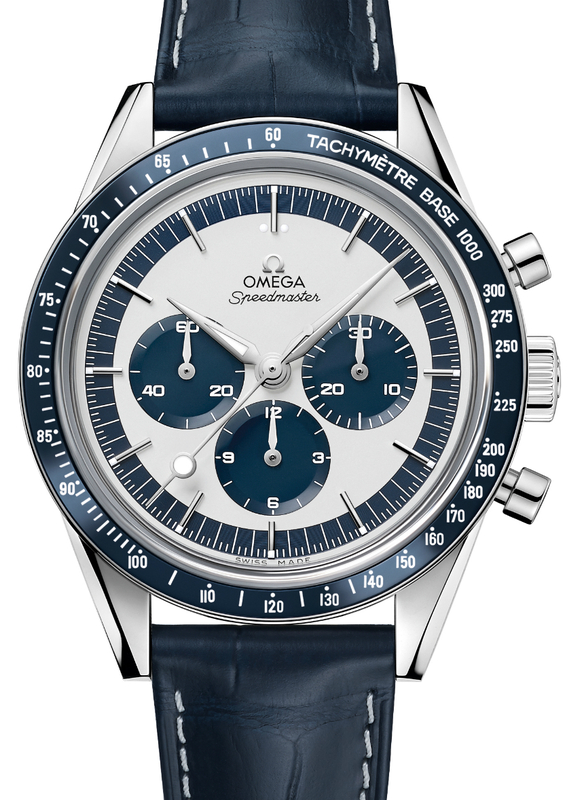 Say hi to the Omega Speedmaster CK2998 Limited Edition. Image via David Coates // The Observer. 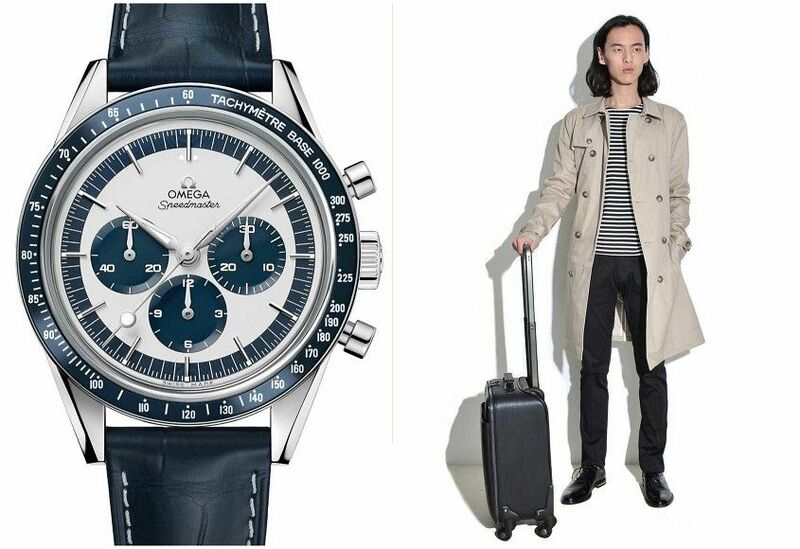 Whether you’re an investment banker or a spy, a stay-at-home dad or a restaurateur, the following items should be staples in your wardrobe: a Breton top, a trench coat, a Moonwatch. In the T+T-imagined utopia which we hope will one day be a reality, every man will be issued with this uniform on his 18th birthday, safe in the knowledge that he can go forth and achieve anything in this outfit. Until then, if you are not 100 per cent confident that you own the full set, now’s the time to do something about it. Go on. We’ll still be here when you get back. 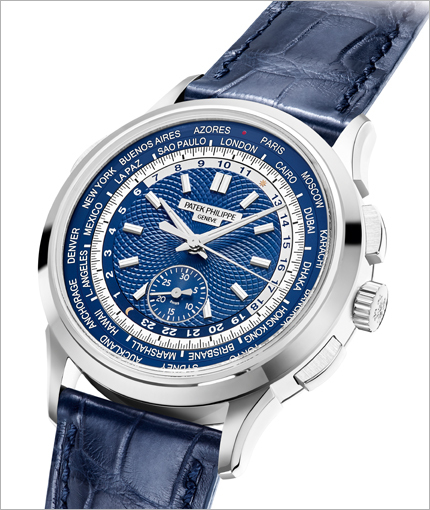 The white gold Patek Philippe 5930G-001 World Time Chronograph. And what does it go with? 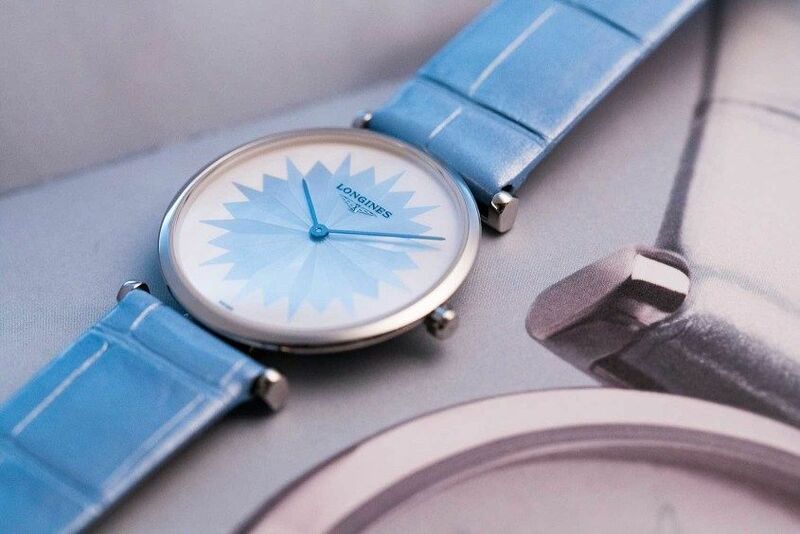 La Grande Classique de Longines, on a powder blue alligator strap. 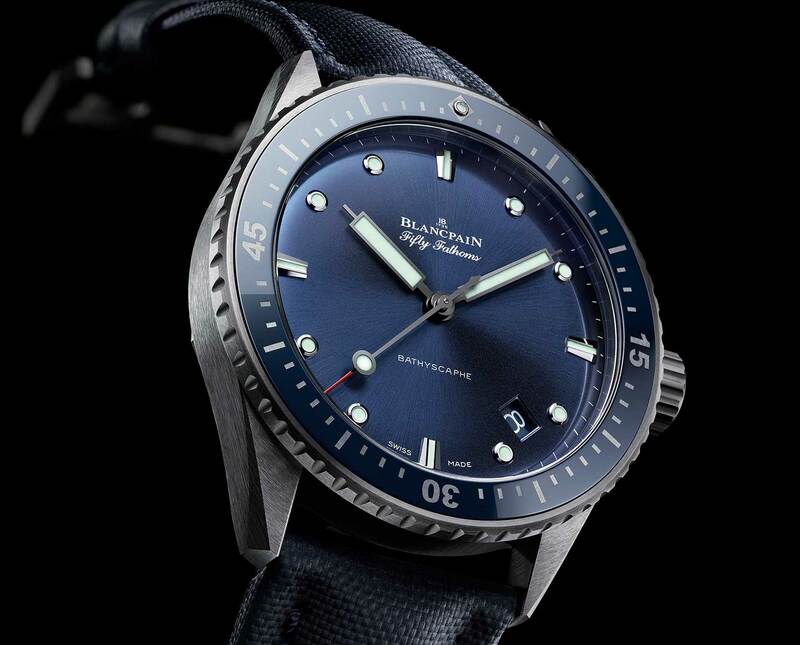 Blancpain Fifty Fathoms Bathyscaphe, in grey plasma ceramic on a sail canvas strap. 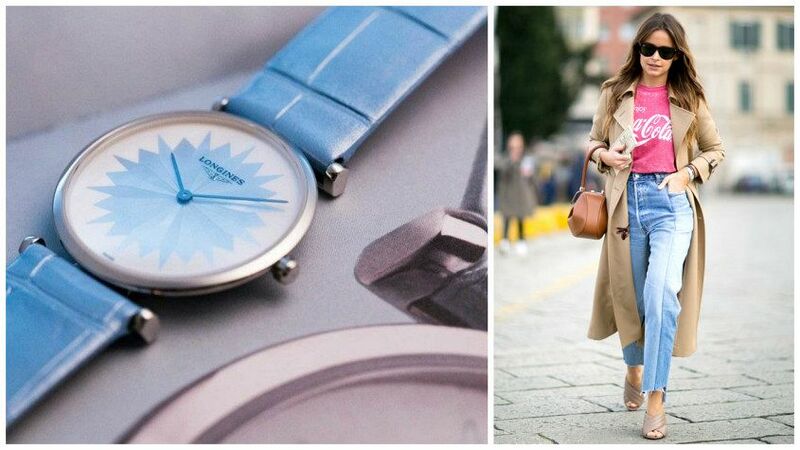 Nautical is a trend that will never die. Like Bert Newton and Keith Richards, it will keep on reincarnating itself regardless of the drug overdoses and wig malfunctions life throws at it, so there’s no point trying to avoid it. In which case, there are two ways to tackle it. 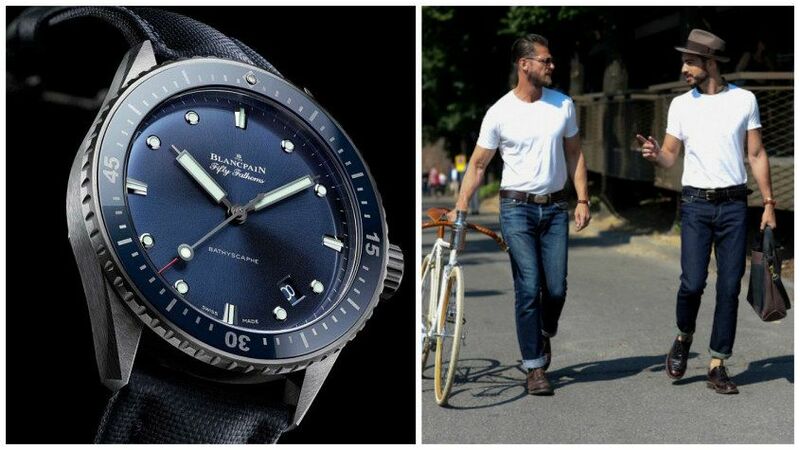 The first is to hire a sailor’s costume from your nearest dress-up shop – and please bear in mind that this is how most navy and white ensembles look to the casual observer. The second is to keep things low-key in indigo denim and crisp white T or jersey. We’re pretty sure you know which one we’re erring towards. 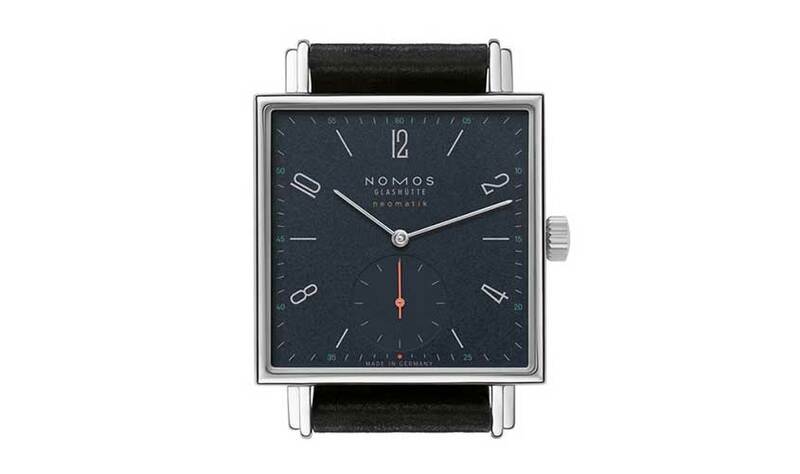 The too hip to be square Nomos Tetra Neomatik. Even when worn with the most yawn-worthy of outfits, this has the power to make you come across as interesting thanks to the unconventional shape. (NB – does not apply to Mark Zuckerberg and his normcore wardrobe. Nothing can save that situation.) Low-key rebellions such as this are precisely what get us through tedious dress codes – especially at work. 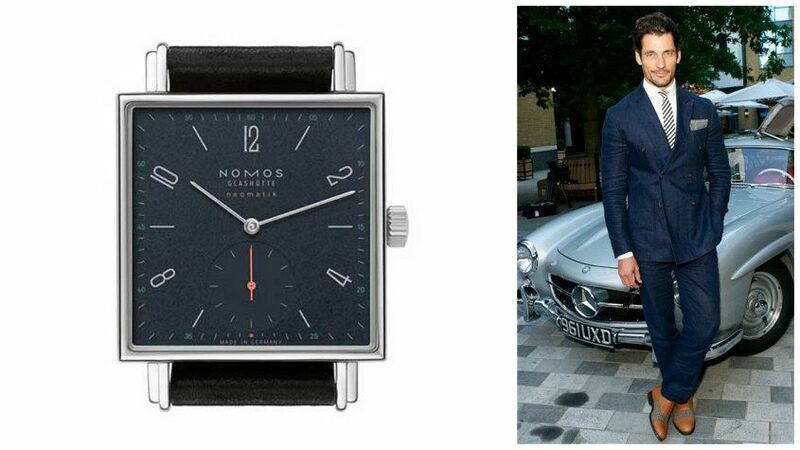 Granted, if you’re David Gandy leaning against a vintage Benz, you’d look good in, well, Zuckerburg’s clothes. But he’s also demonstrating how to stick to a uniform without losing your own personality. 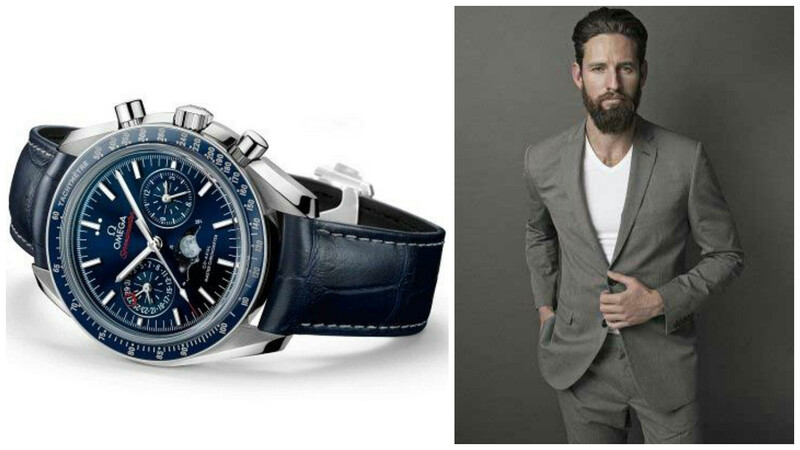 Your choice of watch is key, as are the shoes, tie, pocket square and sunglasses. 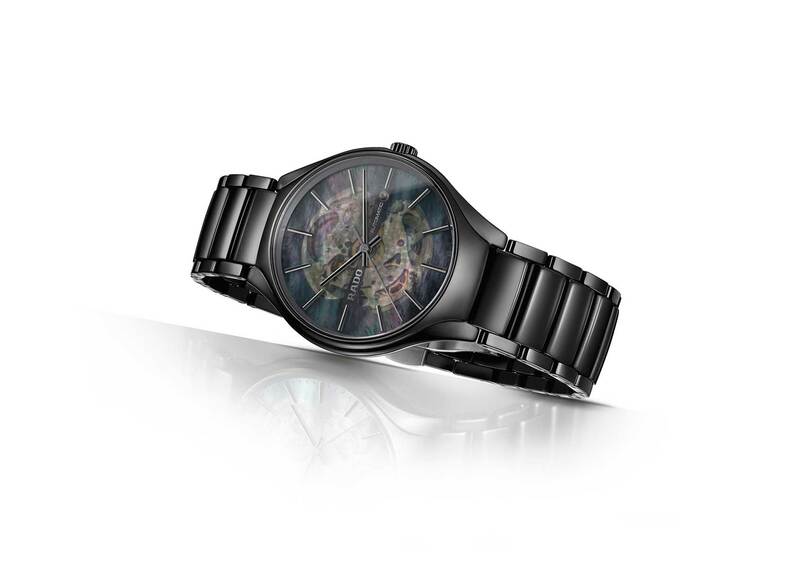 It’s Rado’s limited edition True Open Heart, in matt black ceramic, with dreamy mother of pearl dial. Maybe you run a portfolio of successful tech start-ups. Maybe you just want to look like you do. 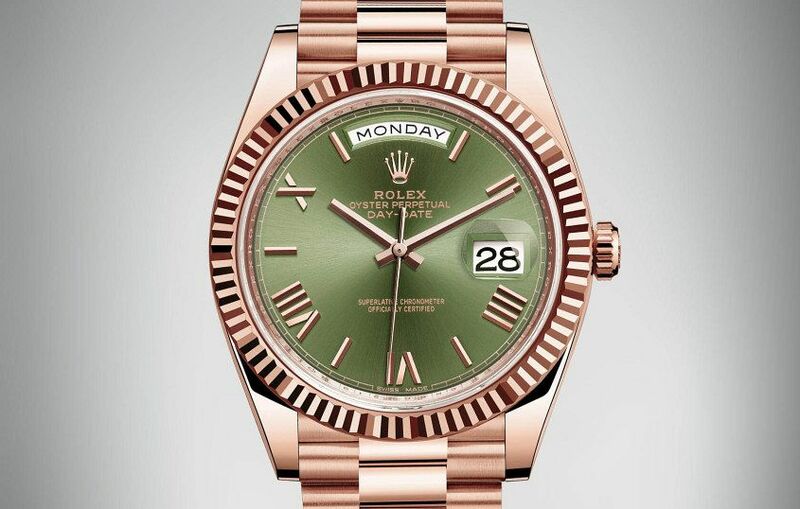 This watch will help. Once you’ve finished geeking out at the mechanical peep-show through the dial cut-outs, get your Gattaca vibe on with futuristic fabrics and minimalist shapes. 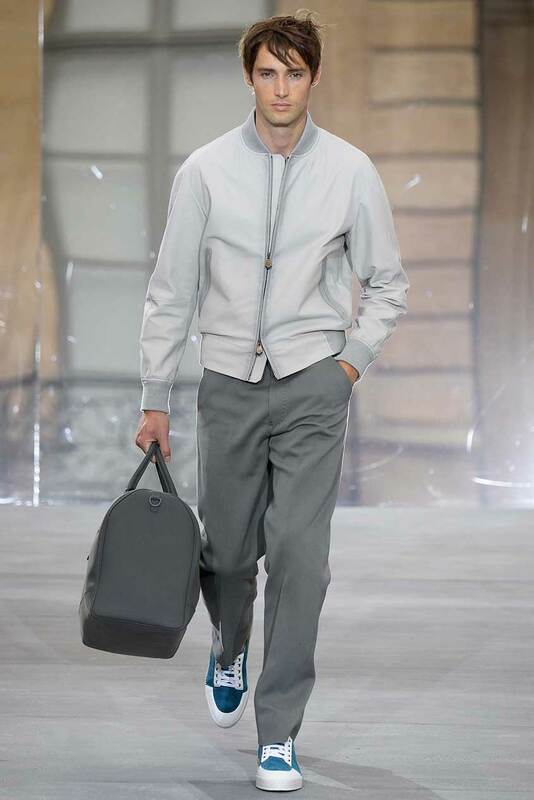 We love this greyscale Berluti ensemble, with trousers in ultra-light, paper-textured cotton and a nubuck calfskin blouson jacket. 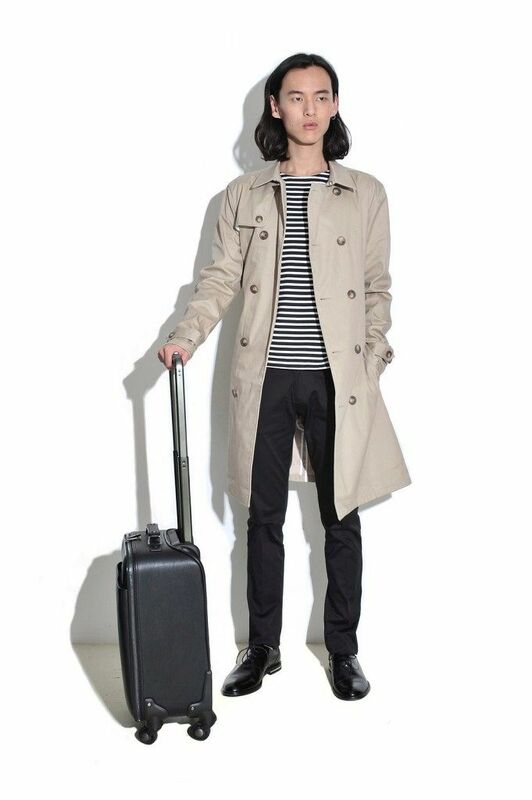 Let’s pretend the holdall is full of hundred dollar bills, even though you haven’t handled actual cash since 2004. It’s the Omega Speedmaster Moonphase Chronograph Master Chronometer, in brilliant blue. 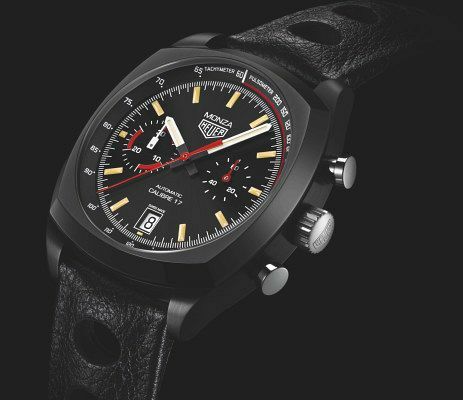 The brand new TAG Heuer Monza, an on-point reissue of their 40 year-old classic cushion case. 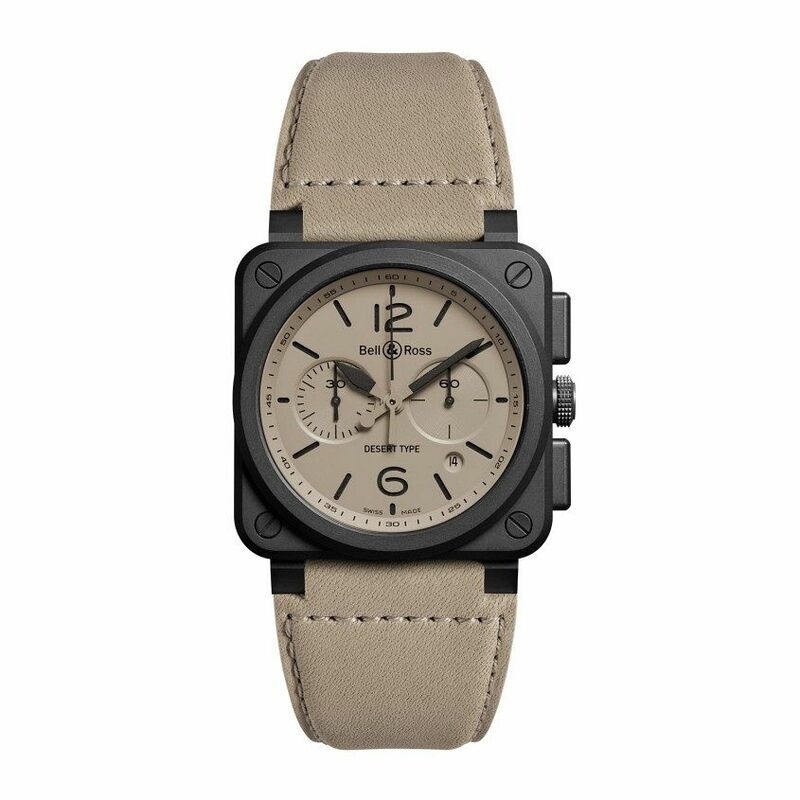 A timepiece this rugged might tempt you to go full-on Action Man, complete with camo and night-vision goggles. We’re down with that. But why not try this instead. 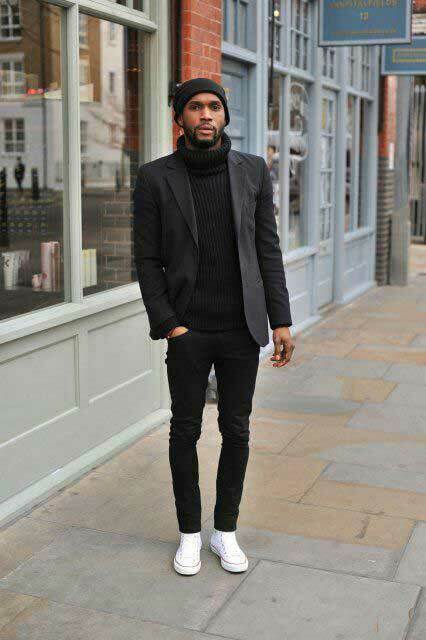 Straight-leg jeans, roll-neck sweater, blazer, all in black. The overarching theme is still ‘stealth’, but the benefit of this version is that it works in a whole range of scenarios, not just a foxhole behind enemy lines. You’re welcome. 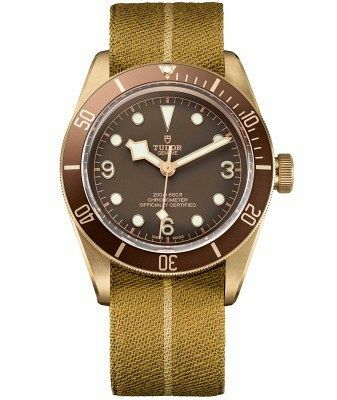 It’s the Tudor Heritage Black Bay Bronze, on a military-inspired jacquard woven strap – though it also comes with an aged brown leather option. Reminder: the weekend is not just a two-day rest from workwear. 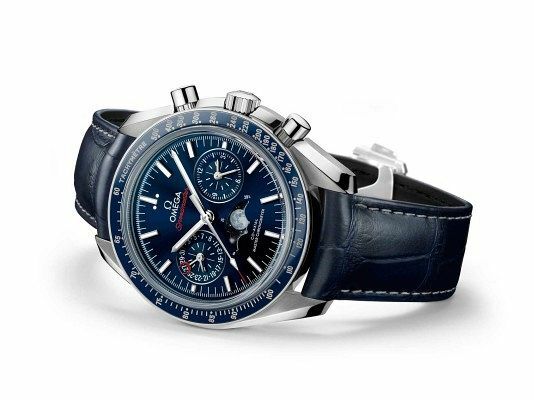 Granted, you are legally permitted to spend both Saturday and Sunday in tracky-dacks and pluggers, but this watch deserves better. 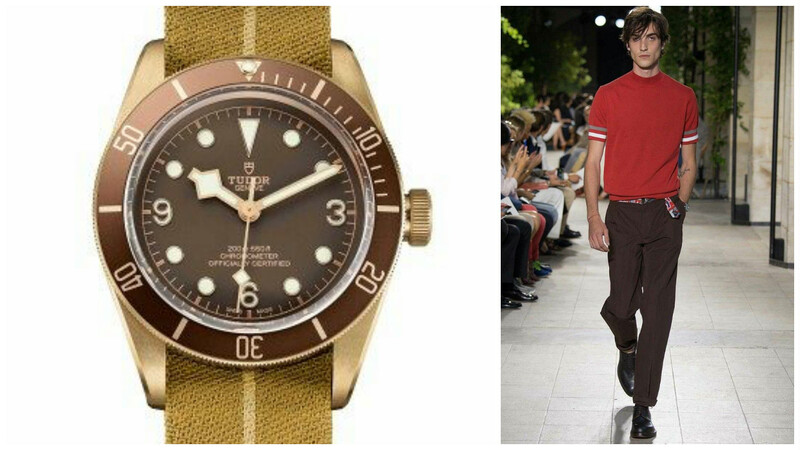 Do yourself a favour and learn how to do ‘casual’ properly, starting with the mid-century silhouettes from this year’s runways in rich tones that’ll work a treat with the Tudor. 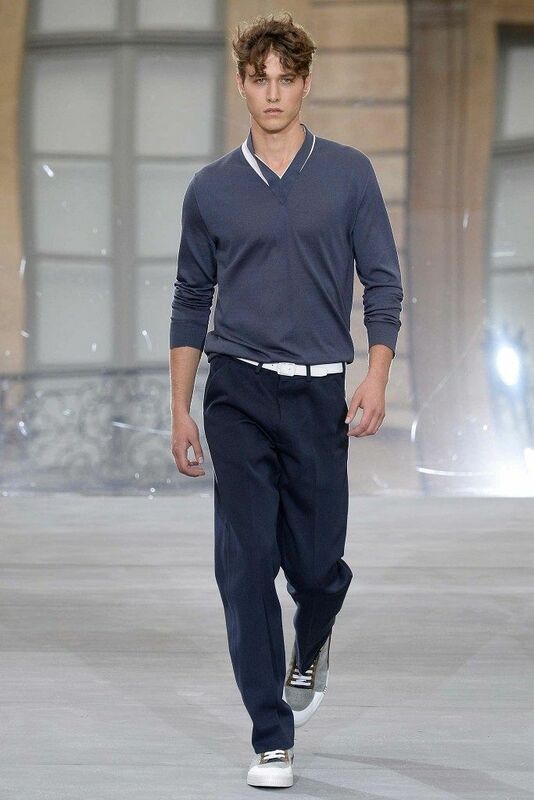 Top marks to Hermes for this short-sleeved sweater and roomy trousers. 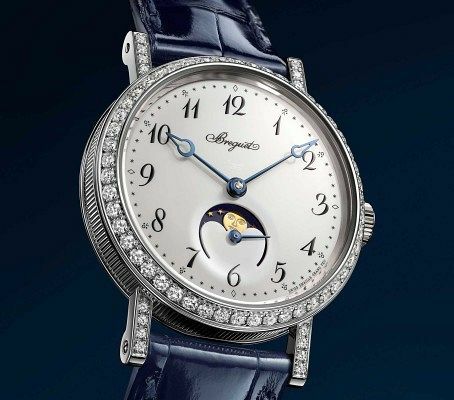 The tastefully diamond set Breguet Classique Phase de Lune Dame 9088. 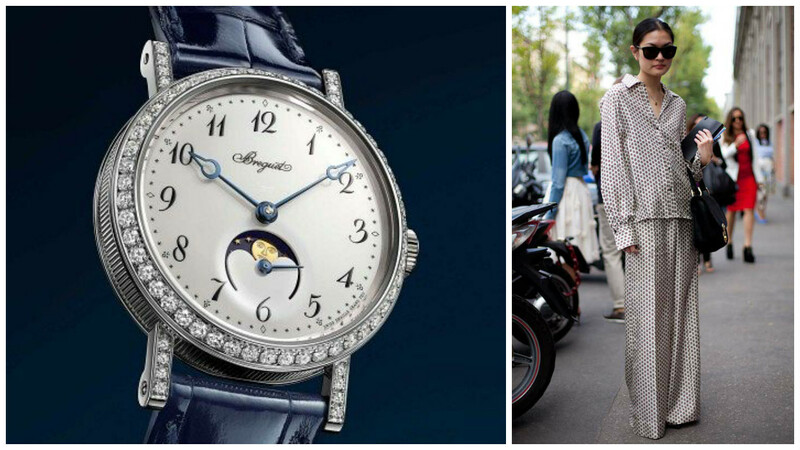 Honestly, could there be a sweeter partner for this Breguet’s moon and stars than pyjamas? (Answer: no.) A trend that’s been floating silkily at the edge of the sartorial scene for a couple of years now, like a half-remembered dream, it’s showing no sign of going anywhere. 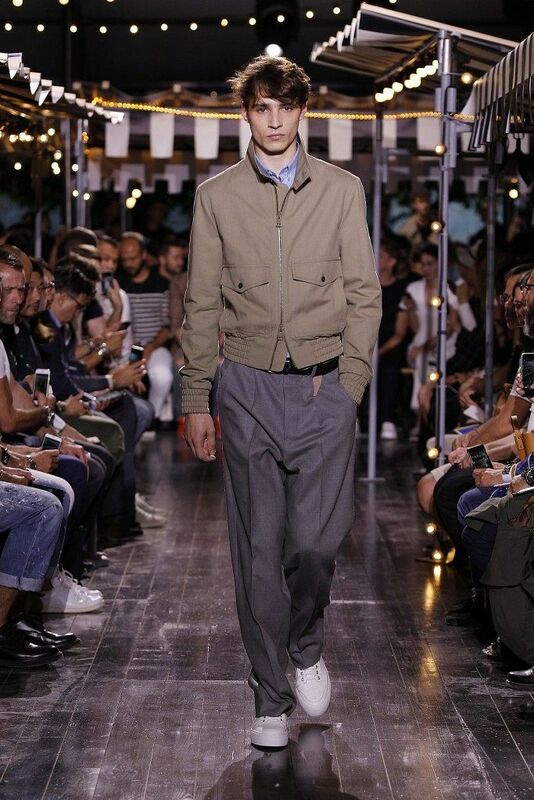 There it was again for Spring-Summer 2016 courtesy of Givenchy, Alexander Wang and Dolce & Gabanna – so we say it’s time to give in and go sleepwalking. 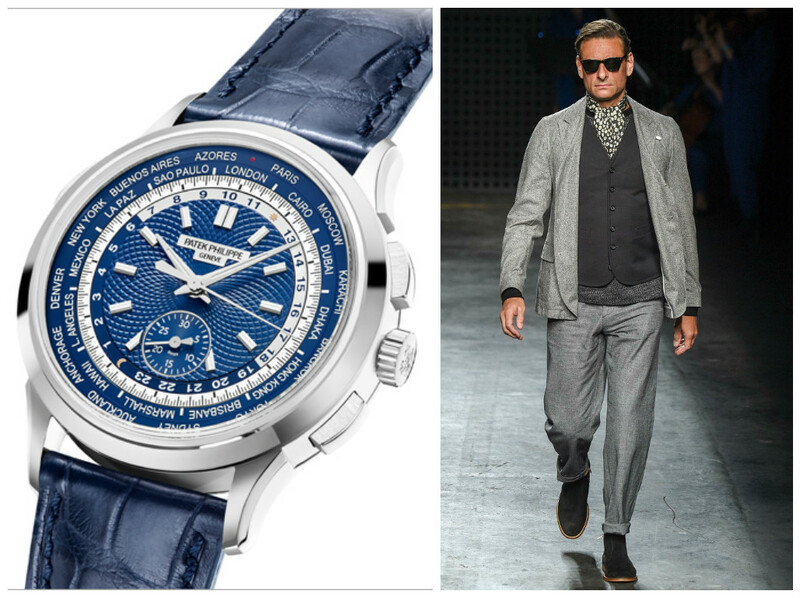 Lookbook Explainer: This year, we’re not only telling you about the latest and greatest watches coming out of Baselworld, we’re doing some extra legwork and matching them with key looks to make the rest of your ensemble easier to get together. In the interests of full disclosure I need to come right out and say that Ceri David, the fashion writer we’ve called on for the project, used to be my boss. She was the editor of GQ and I just one of a few humble scribes that wrote the bulk of the magazine under her direction. Ceri was a great leader. She knew what she wanted from GQ Australia and she made it happen. We did heaps of things together that I’m proud of. One of them was conquer all sense of reason to walk on the wings of a bi-plane in the name of, well, I don’t know what. Feature image by Nikola Jovanovic for Massimo Dutti.